La Buganvilla - Hotel Botánico is a modern restaurant offering Mediterranean cuisine. The average price of a main course dish at the La Buganvilla - Hotel Botánico restaurant is 17 euros. 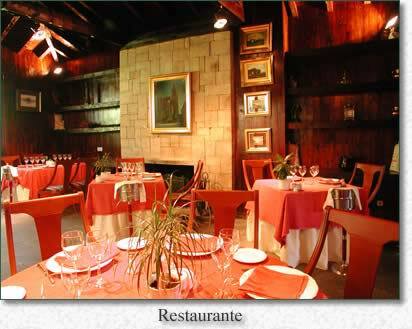 The average price of a 3-course meal at the La Buganvilla - Hotel Botánico restaurant is 40 euros. Note that although GoMadrid.com strives to maintain all information about La Buganvilla - Hotel Botánico up to date, the prices mentioned are only an indication and may not reflect the exact value of your meal. Located in the countryside, close to a golf course and the famous monastery of San Lorenzo de El Escorial, this restaurante forms part of the Hotel Botánico which occupies what was once a large mansion, now refurbished and surrounded by 6000 m2 of gardens, including a large tent for a further 100 diners. The beautiful views enhance the dining experience, along with the possibility of visiting nearby San Lorenzo and its monastery. The restaurant specialities are rice dishes, Buganvilla style hake in a port wine sauce with currants and shrimps, cod, mandarine orange sorbet and lemon sorbet with champagne. The service is impecable. The address of the La Buganvilla - Hotel Botánico restaurant is: Timoteo Padros 16, San Lorenzo del Escorial, 28200 Madrid. Please see the La Buganvilla - Hotel Botánico restaurant location map below.